This waterfall is located in a dramatic ravine of Rio Paucerna - one of the largest streams on the enormous Caparu tableland. 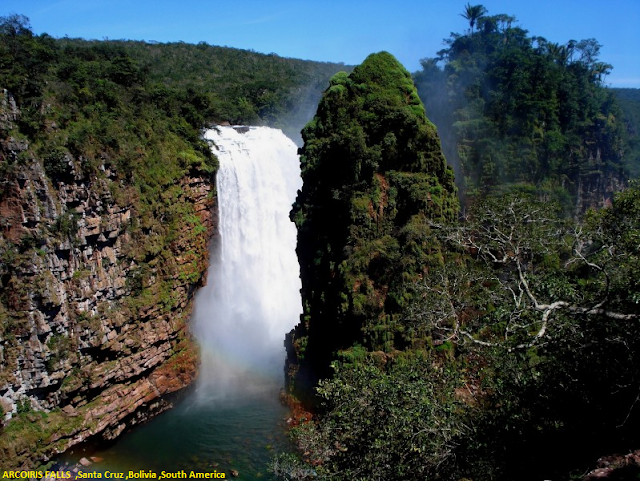 The 88 m tall Arcoiris Falls are the first major falls at the rim of plateau - 6 km further down the stream are the spectacular 25 - 45 m tall Frederico Ahlfeld Falls. To get to the Park it is advisable first to go to San Ignacio de Velasco, following the route: Santa Cruz - San Ramón - Concepción - San Ignacio. A San Ignacio can be reached by bus, but not to the Park, so the best thing to do is to go on your own or rent mobility. After visiting San Ignacio you return a few kilometers to then take the road to Los Fierros and Flor de Oro or (Criato) in the heart of the Park. It is also possible to rent light aircraft from Santa Cruz to reach the Park.